Spring Auctions are held on the First Sunday in March. Fall Auctions are held on the First Sunday in November. 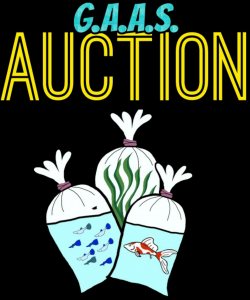 We welcome Fish and Aquatic Animals, Plants, Hard-Goods (Hard-Goods include Tanks, Equipment, Accessories, Food, as well as Fish or Hobby related items such as home decor etc) to be brought in, we will then auction off these items to be sold. 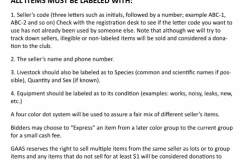 There are usually several raffles such as…. Item Raffles – Usually include a selection of several displayed higher value items in which you can purchase tickets and choose which item/s you wish to enter them for. Simply purchase your tickets and place them in the cups in front of the items you hope to win! 50/50 Raffles – Several of these raffles are done periodically throughout the length of the auction. In these, tickets are sold at $1 each, and the winner who is drawn receives 50% of all the ticket sales for that particular 50/50 Raffle. Vendors – In addition, from time to time at these events, we may offer tables with the ability to purchase Club Merchandise such as our logo Shirts, as well as independent vendors selling Fish Bags, Caves, and other hobby related items. FOOD– all this shopping and selling will make anyone hungry. It’s a good thing our excellent Kitchen Staff always provides a very reasonably priced and tasty selection of food, drinks, and deserts. Re-bagging Station– Dealing with plastic bags full of water, accidents happen… Don’t worry we provide a re-bagging station with dechlorinated water and supplies on hand for those emergencies. Helpful Tips for bagging your fish! These fish are in bags for quite a few hours, please be aware especially with large fish that water can foul quickly. Make sure you have enough water and air available in a large enough container to preserve your fish' health for this duration. It's also a good idea to fast your fish a day or so before the auction to help reduce the waste produced. Ideally bags should be half water and half air. Bags should also be as "blown up" with as much water and air as possible to form a tight tube, this helps keep fish from getting stuck in corners or crushed by other bags. Double Bagging your fish (while not mandatory) offers more protection against leaks. Tying or Banding double bagged fish at opposing ends helps protect your fish from getting stuck in the corners as well. 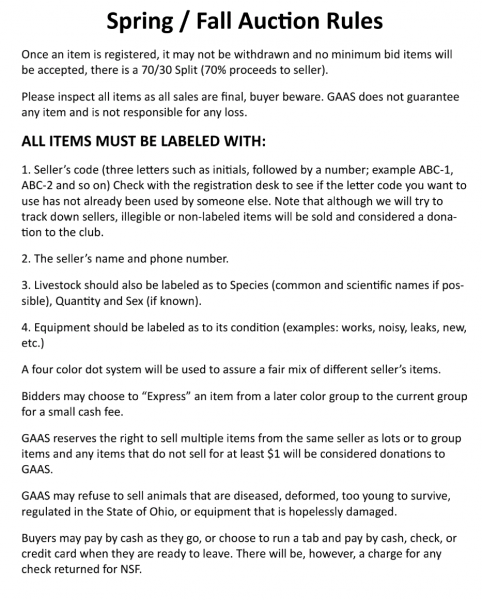 Click Below for complete Spring and Fall Auction Rules and Instructions.